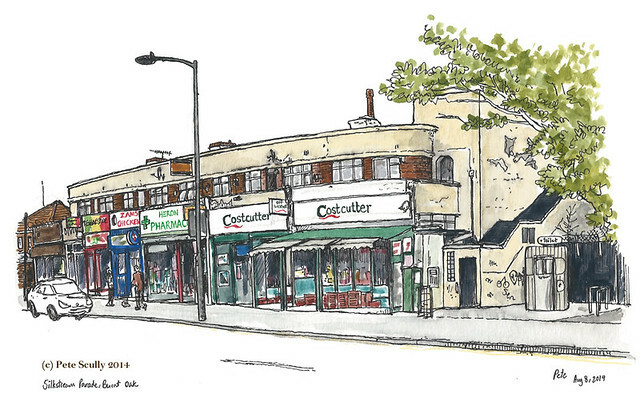 I always intend to sketch more Burnt Oak whenever I’m back home but I never quite get around to it. And I should – the old place keeps changing in small, and sometimes pretty big, ways. Since my last trip, at least one of the historic focal points of the area has closed down, probably for good: the Bald Faced Stag, the old pub on Burnt Oak Broadway. Love it or loathe it (and it was often pretty loathed), the Stag played a big part in many of our lives as Burnt Oakers, and it just doesn’t feel right that it’s no longer there. What then is left of old Burnt Oak? Rather a lot, B.O. fans, rather a lot. I did a quick solo-sketchcrawl one afternoon, starting with the distinctive buildings of Silkstream Parade, above. This is between the Library and the Station, and to many of us these were the shops you went to when you went Up The Road. The old newsagents on the corner, at one time called Magson’s but I don’t recall its previous name, was replaced by Costcutter’s many years ago, but you can still see the long-disused cigarette vending machine on the side of the building. Heron Pharmacy is still there, unchanged in decades. Zam’s chicken is where Toni’s used to be, an old ice cream and sweetshop, I remember showing my Mexico 86 sticker album the Italian guy Toni who ran the place and him telling me all about the Italy players. Whenever I think of Paolo Rossi I think of Very Cherry Slush Puppies (remember them? You remember them). The kebab shop is also long gone, that had one of the most often broken windows in the whole of England I recall. There used to be a butchers shop here too, and was there a greengrocer’s? Was that the whole set? Tanning salon now. Anyway that’s enough “How We Used To Live”, any more of that and I may as well start every blog post with “Who remembers Penny Sweets, remember them eh, Kola Kubes eh, not like that any more eh”). I moved up Watling Avenue to Hassan, which has been there since before I was a kid, unchanged. They don’t make shop signs like that any more, it’s all primary colour plastics now, but Hassan has class, gilded edges which of course my sketch doesn’t really show. 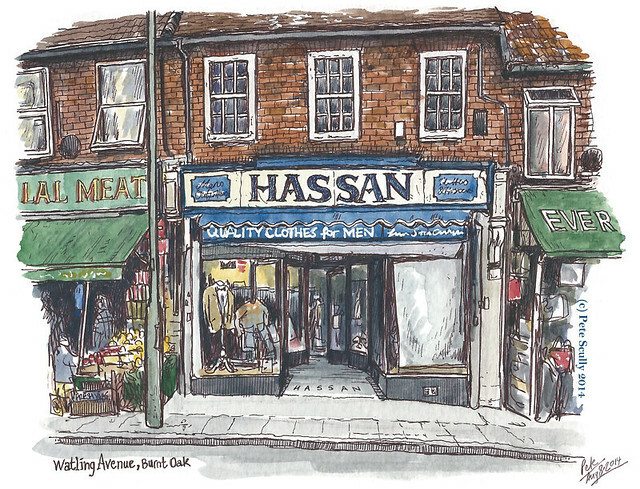 Not being much of a clothes shopper, and this being a clothes shop for Men (my Mum, not being a Man, never dragged me through this shop as a kid, unlike John Ford and other Burnt Oak shops), I’ve never ever been inside Hassan’s. I know people who do, people who live far from Burnt Oak and come out of their way to go there. Personally I just love that it is there, still there. So now I’ve finally sketched it. I stood opposite outside a closed-down cafe on the corner of Gaskarth Road. Cafes, eh, remember cafes? Don’t get cafes any more, it’s all Starbucks these days, etc. Sketching across Watling Avenue wasn’t too difficult. As busy a street as it is, it’s pretty narrow. 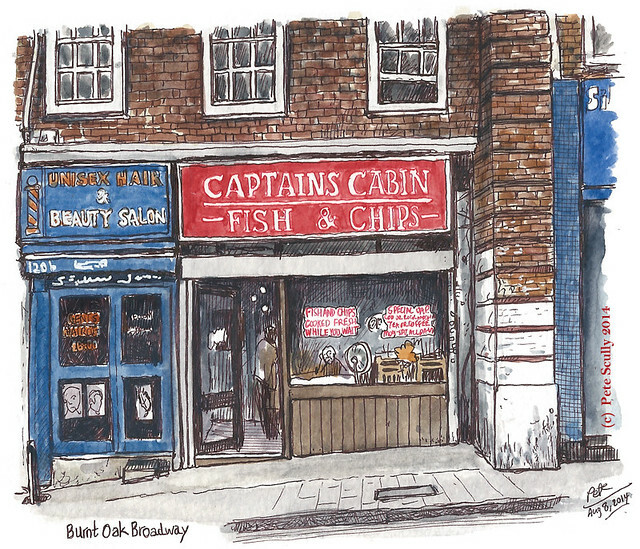 Burnt Oak Broadway on the other hand is much wider, so when I sketched the old fish and chip shop the Captain’s Cabin I had to squint a lot more. Burnt Oak Broadway is what we call this part of Edgware Road, itself part of the ancient (and I mean ancient) Watling Street, the long straight road built by the Romans linking Londinium with the north-western reaches of Britannia. It’s from Watling Street that Watling Avenue gets its name, and in fact the name Burnt Oak is a reference to the old Roman custom of burning an oak tree to mark the boundaries between places, or so we were told at school. See, my town got some history, bro. This chip shop is pretty much the only one in ‘downtown’ Burnt Oak (to use an Americanism) left from the Olden Days (“who remembers fish’n’chips, eh, vinegar, chip butties, eh, it’s all piri-piri cappuccinos now”). I do remember there was a Kentucky Fried Chicken next door when I was a kid (remember those? No seriously, you don’t get them any more, all KFC now) and a Barclay’s Bank on the corner which got turned into an amusement arcade, not sure how amusing it really is though, maybe it amused NatWest across the street. The Captain’s Cabin is still there, the sign is different from when I was a kid, so I sketched it. Personally I used to get my chips from the Golden Fry down the Watling, where they had the Space Invaders games my brother used to play (“Who remembers Space Invaders, eh? Don’t get that any more, it’s all Minecraft and Halo and Words With Friends now”). Captain’s Cabin for me was always that bit further to walk for the same thing, but I still always liked their chips. And here is a map of Burnt Oak, you don’t get maps like this any more, it’s all iPhones now, but it was with maps just like this that I managed to navigate my way around town when I was a kid. No not really. 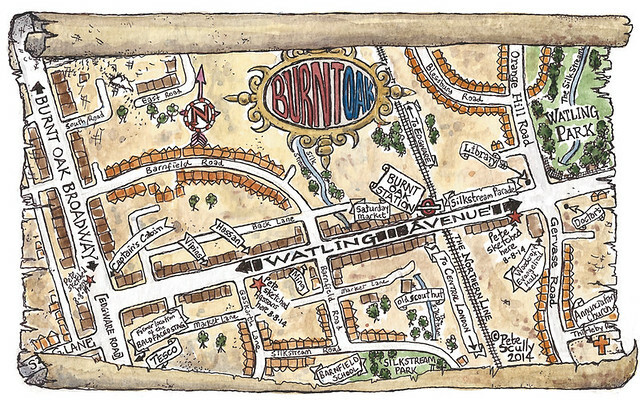 I just wanted to draw a bit more of a fun treasure-island-style map (and yes I know north is in the wrong direction, I’m not working for the Ordnance Survey or nothing) for my home town (and yes Burnt Oak is not an actual ‘town’, just a small nook in the expanse of London, an offshoot of Edgware really, but Burnt Oakers everywhere, even those who have long since emigrated to the far-flung corners of the world, we know that it is its own place, our home town, but once you start getting too sentimental it’s only one step away from “Who remembers bus passes, remember bus passes eh, get on a bus and go somewhere yeah, can’t do that now eh”). I do love to sketch the place though, to capture it for old time’s sake, because by golly it changes fast. But…not that fast. 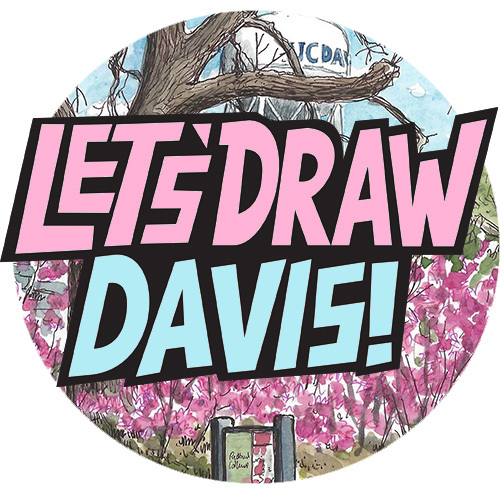 Great sketching and very entertaining stories! Cherry slush puppies, penny sweets and chippy chips doused in vinegar …. Aaaah. Nostalgia. Now I’m craving British chips and malt vinegar. And Kola Kubes, don’t forget those. And those wierd frozen orange ice things that were triangles but with four sides, used to get them an’all. Oh I had totally forgotten those orange things. It was a lesson in geometry just eating those. Kola Kubes were ace. I found our local squirrels also like them. Later I graduated to Kola Kube vodka. Sherbet lemons and soor plooms and aniseed balls too. Delish. Kola Kube Vodka? Never heard of that, can imagine that’s quite nice. I lived above a pub in Edinburgh that sold scores of flavored vodkas. Some were just bogging but Kola Kube and Parma Violet were delicious. My brother tells me you can DIY it by crushing or crumbling the sweets into a bottle of vodka and letting it dissolve over a period of time but I’ve never tried for myself. As always, enjoying the style and detailing of your work. I meant to say, I love your maps. They are so creative. Thanks! I’m a bit map-mad at the moment, but this one comes from reading loads of old Fighting Fantasy books recently. I loved your trip down memory lane! It reminded me of buying penny candy on the way home from school. Those were the days when as a grade school student you could walk home by yourself. Oh,the days of innocence. You must stop with this nostalgia! Penny sweets, though, quite often a big con, our local shop used to charge 2p for Cola Bottles, “Rip-off Britain” at its worst. Thanks Pete – these are amazing! I have many happy memories of Burnt Oak. Although the day my dad left our new puppy in the Bald Faced Stag after a days drinking was not a massive highlight! in early teens, worked in an ‘old fashioned’ grocers nearer the top on the right. My proud grandmother’s expression changed when I served her a bag of broken biscuits – that I picked up by hand with dirty fingernails. Got the sack after reading out an ‘avant-garde’ poem with rude words. Perhaps that wouldn’t happen now the Stag has gone! Back in the 1970s I got dragged into john Ford.The Co Op balcony bar I can remember too.Toni down the Watling Avenue he was generous with the sweets.I Made it back there yesterday and took a walk down the Waling Avenue.The Bald Faced Stag is now boarded up downstairs.Always remember Burnt Oak a lot of memories’ standing there after all those years.